…this is a damaged beauty. One side of the shade has been damaged and repaired. 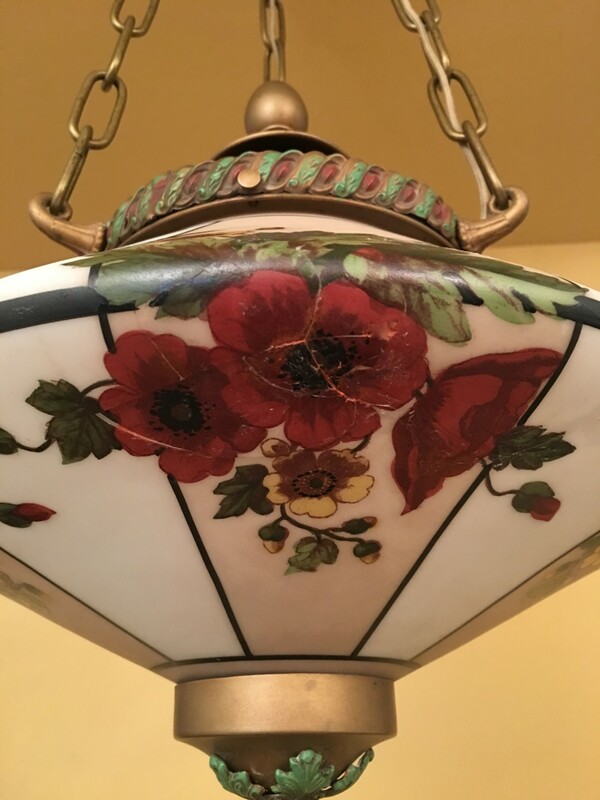 Normally, I do not buy damaged fixtures, but this one was just too stunning to pass up. 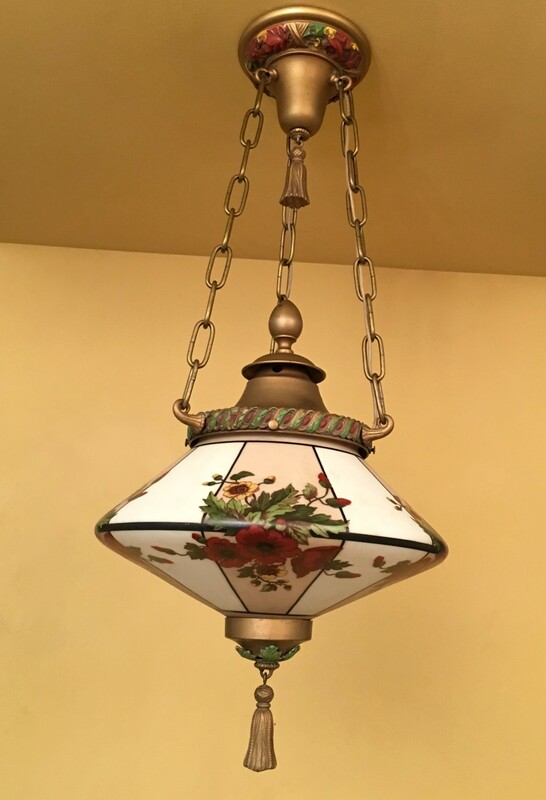 Also, depending on how one positioned the pendant, the damaged side of the shade may not even be visible. 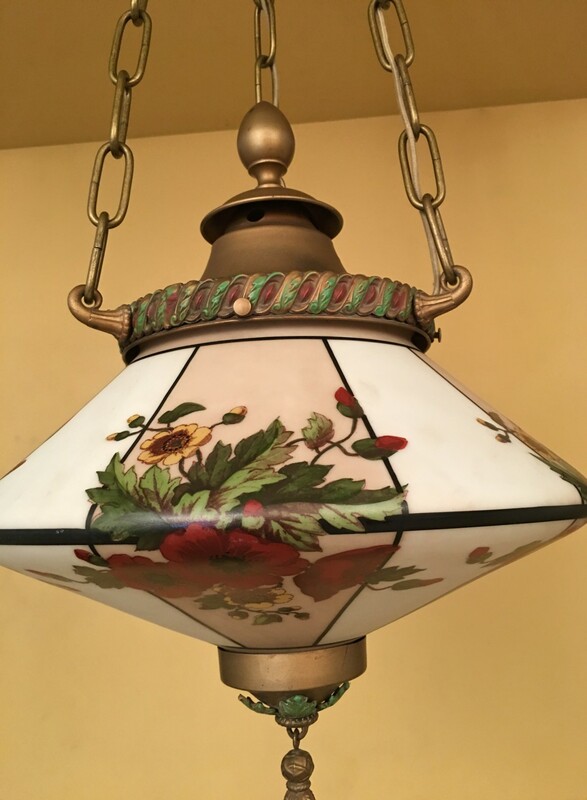 For example, in the Cross House, if I hung this in the round Receiving Room (where it would look FABULOUS), and faced the damaged side of the shade to the NW, I would never see the repair work as I enter/leave the room from the SE. Mostly though, I purchased the fixture for the same reason I have taken in sick/injured animals. How can one say no? Wow, that is a beautiful piece. I’m with you on installing it somewhere the damage would not be obvious. What’s the style/vintage? Teens/twenties towards the end of Art Nouveau? The fixture is 1920s. I would call it a Romantic Revival piece. She’s beautiful ! Question is “Was Gorilla Glue involved”? I did not do the repair; it was like that when I purchased the fixture. And I doubt GG was used!